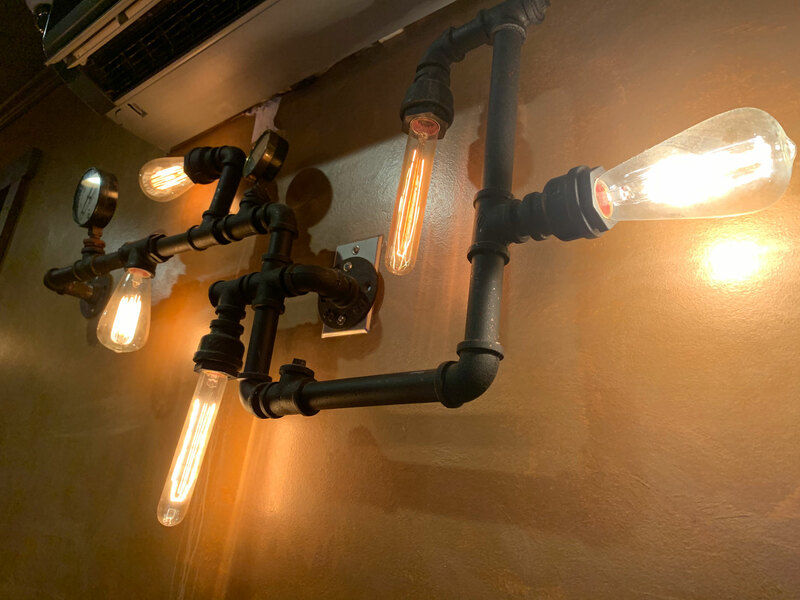 Recently, I wrote about our second blog visit to an Alebrije restaurant and how it compared to our initial visit five years earlier. Unintentionally, history repeats itself this week. You see, in 2016, Julie and I visited the Liberty Taproom in Exeter Township. We loved everything about our meal there and we were very excited when plans were announced for a sister restaurant, the Liberty Ale House, to be opened later that year. 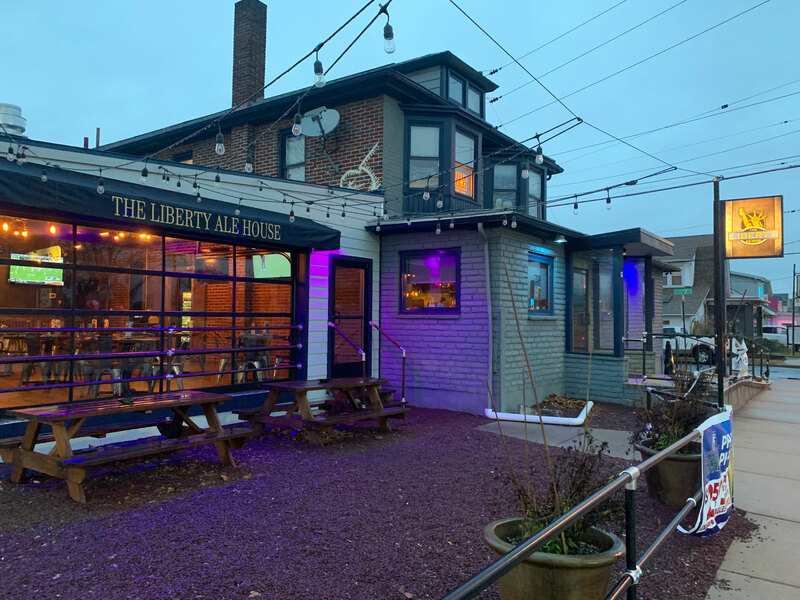 The Liberty Ale House sits in a small building along Lancaster Avenue in Reading (the restaurant is within the city limits, but barely). From the outside, it looks more like a house than a restaurant, except for the enclosed porch filled with chairs and the string lights above the outdoor seating area. When Julie and I visted in December, we were on our own (Jakob was spending some quality time with his grandparents). We were seated at a high-top table for two just inside the door on what was a quiet Friday evening. The menus at the Ale House and the Tap Room are similar. Both offer a selection of tacos, burgers and sandwiches, but there are noticeable differences. 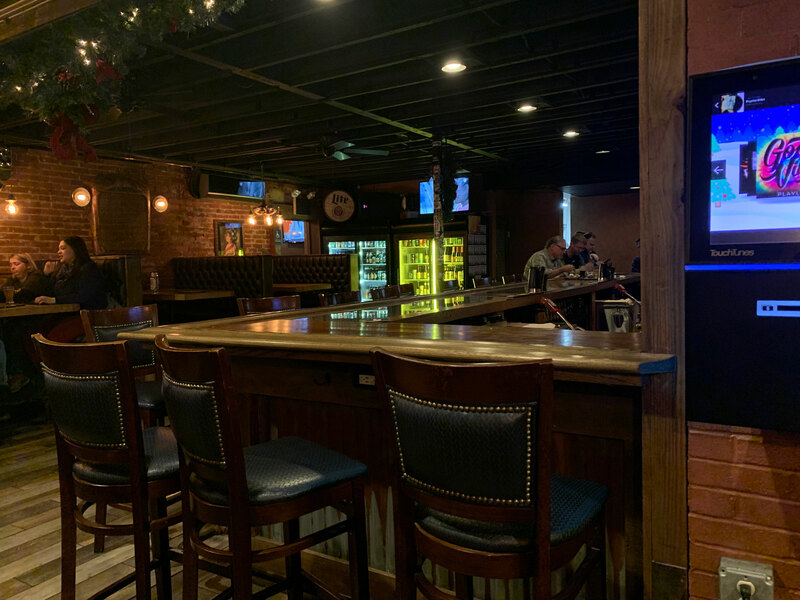 The Ale House menu is a little smaller with no pizza or Stromboli like the sister restaurant has. One thing both offer is wings, but there are even differences here. 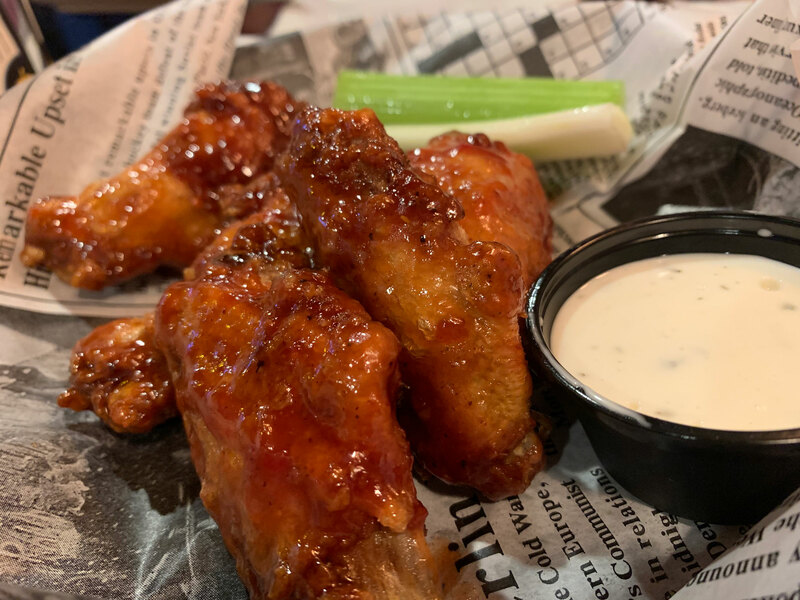 During our visit to the Taproom, the standout of the night were the wings. Coated in Dr. Pepper BBQ sauce, they are among the best around. The only BBQ options at the Ale House were sweet jerk BBQ and pineapple Siracha BBQ (there is also a Memphis dry rub, for those who like their barbecue without sauce). We ordered five of the sweet jerk BBQ wings, and I have say that I was a little disappointed. That’s not to say that they weren’t good – they were – but they weren’t as good as the Taproom, in my opinion. The sauce was fine, a little less thick, with a little sweet and spicy profile. They were good wings, but I was hoping for great. Thinking back on our visit to the Taproom, I remembered how much I enjoyed the burger. So when I saw something on the ale house menu called the G.O.A.T. burger, how could I resist. 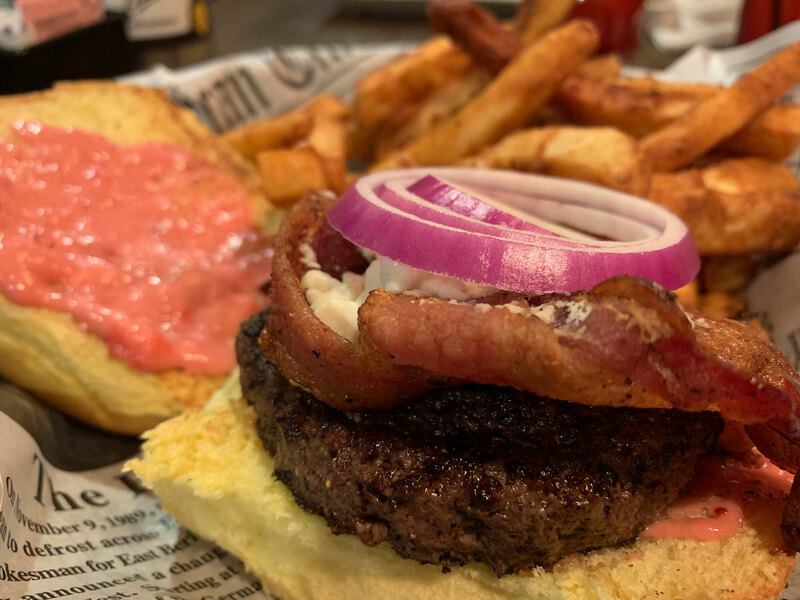 The Angus beef burger was topped with bacon, goat cheese, red onion and cranberry aioli. It’s definitely not the “greatest of all time” but it’s a good burger. I love goat cheese on a burger – it adds a creamy element that you don’t get from sliced cheese and the tang works well, epsecially with bacon. I was a little let down by the cranberry aioli. It wasn’t bad, but I just didn’t feel like it added as much flavor as it could have. Overall, though, I was happy with my selection – and with my decision to upgrade to fries. Sure, they are a little greasy, but they are good. 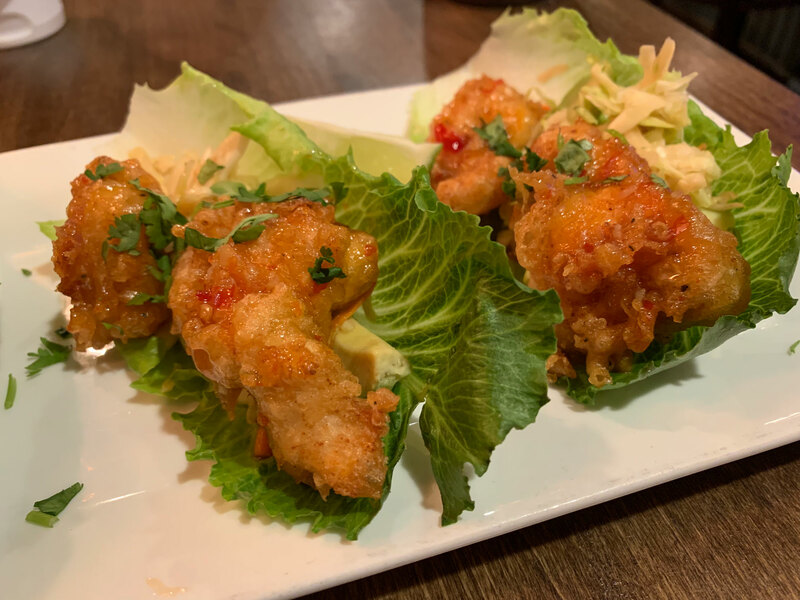 While my meal packed on the Calories, Julie went the other direction, ordering Thai chicken tacos while opting for the lettuce wrap instead of a tortilla. The tacos featured tempura fried chicken, sweet Thai chili, shiso cucumber slaw, avocado and cilantro. We were both impressed. The Thai chili sauce was flavorful and it had some heat, but not too much. The slaw was very good. And the lettuce wraps actually added to the flavor in a way that a flour tortilla wouldn’t have. They also made the the order of the three tacos less heavy and more manageable. In all, we spent about $35 on the night. It was a good meal, though I would add that our server was less than attentive considering how early we were and how few tables she was handling at the time. Three years ago, our meal at Liberty Taproom set the bar high. My meal at the Ale House didn’t quite reach that bar, but I would definitely go back. And I’m sure I would enjoy my meal even more the second time.